PORSCHE gets a lot of grief for making so many SUVs. More than half of its vehicles now are in the utility category, which is a risk (albeit a lucrative one) for a brand considered the paragon of sports cars. That explains the car Porsche unveiled in New York last Tuesday: the Boxster Spyder, a sleek little machine that bumps right up against the famous 911 in the line of sporty rides zooming out of Stuttgart. The Boxster is not designed to haul much more than two people. And while it can go very fast, it isn’t intended for the track. The new Boxster is made simply for driving — preferably on a winding road with the top down. How spartan can a car that starts at US$83,100 (RM302,484) be? Base models won’t have air conditioning or stereos or navigation screens. The interior door handles are made out of fabric. And the seats are adjusted with a single lever, not a flurry of motors. The top, meanwhile, has to be retracted and stored by hand with a series of steps reminiscent of folding a tent. All of this adds up to the Spyder’s sole superlative: it is the lightest Porsche in the line-up at just under 2,900lb. Porschephiles will love this accolade. They’ll also crow about the stick shift. 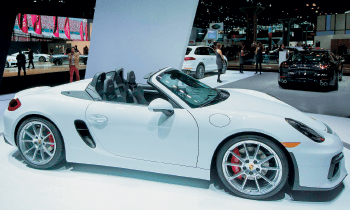 Every Boxster Spyder will have one; an automatic transmission isn’t an option. Porsche’s famous PDK paddle-shifters would be both faster and more efficient, but this Boxster isn’t interested in that. For the same amount of money, a customer can get a higher-end Porsche 911 with no extra features. A lot of people who pine for a Porsche will do just that. But in the United States in February, the average 911 sold for US$127,000. Meanwhile, Porsche’s global registrations have doubled in the past five years and its US sales have surged almost as quickly. In short, a Porsche — even the Porsche, the 911 — isn’t that special anymore. The Boxster Spyder, however, is truly unique. Porsche won’t sell a lot of these cars. And forgoing a stereo to save about 10lb of curb weight is just silly. But every once in a while, the product team has to throw a bone to the purists. After all, those are the folks who can’t stop talking about their cars, ultimately selling more Porsches.